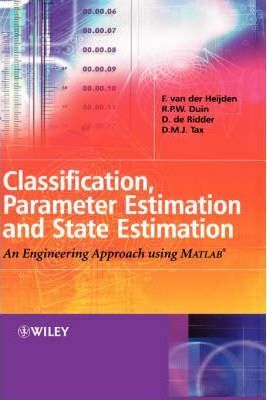 "Classification, Parameter Estimation and State Estimation" is a practical guide for data analysts and designers of measurement systems and postgraduates students that are interested in advanced measurement systems using MATLAB. 'Prtools' is a powerful MATLAB toolbox for pattern recognition and is written and owned by one of the co-authors, B. Duin of the Delft University of Technology. After an introductory chapter, the book provides the theoretical construction for classification, estimation and state estimation. The book also deals with the skills required to bring the theoretical concepts to practical systems, and how to evaluate these systems.Together with the many examples in the chapters, the book is accompanied by a MATLAB toolbox for pattern recognition and classification. The appendix provides the necessary documentation for this toolbox as well as an overview of the most useful functions from these toolboxes. With its integrated and unified approach to classification, parameter estimation and state estimation, this book is a suitable practical supplement in existing university courses in pattern classification, optimal estimation and data analysis.This book: covers all contemporary main methods for classification and estimation; takes an integrated approach to classification, parameter estimation and state estimation; highlights the practical deployment of theoretical issues; provides a concise and practical approach supported by MATLAB toolbox; and, offers exercises at the end of each chapter and numerous worked out examples. PRtools toolbox (MATLAB) and code of worked out examples are available from the internet. It also includes many examples showing implementations in MATLAB. This book enables students to practice their skills using a MATLAB environment. Classification, Parameter Estimation and State Estimation is a practical and concise inter-disciplinary guide for data analysts and designers interested in advanced measurement-based systems. Highlighting the practical deployment of theoretical issues, the book provides a useful experimentation platform for skilled engineers to implement and evaluate design concepts. A fully integrated and unified approach to parameter estimation, pattern classification and optimal (state) estimation. An introduction to emerging techniques such as support vector machines and particle filtering. Implementations in MATLAB using the PRTools toolbox, with appendices providing the necessary documentation and useful functions for this and other existing toolboxes. End-of-chapter exercises and numerous worked out examples within the text and on the Internet. A valuable text for students and researchers in engineering, computer science, physics and applied mathematics, this book will also prove an essential reference for the practising civil, control, electrical and mechanical engineer. Preface.Foreword.1. Introduction.2. Detection and Classification.3. Parameter Estimation.4. State Estimation.5. Supervised Learning.6. Feature Extraction and Selection.7. Unsupervised Learning.8. State Estimation in Practice.9. Worked Out Examples.Appendix A: Topics Selected from Functional Analysis.Appendix B: Topics Selected from Linear Algebra and Matrix Theory.Appendix C: Probability Theory.Appendix D: Discrete-time Dynamic Systems.Appendix E: Introduction to PRTools.Appendix F: Used MATLAB Toolboxes.Index.